8. This was the only piece I had left once I did the cover and it was a little short for a page but I used it anyway. Added in a long envelope. It was too long for the book so I just opened up the end, cut it down, corner rounded the edges and folded it back again. No one will ever know it didn't come that size. The blue sicker is from Russel & Hazel. It says, Nicely Done. I like that. 9. Another pocket page. I used an "oldie but a goodie" rubbing to make the big card in the pocket. 7gypises doesn't make it anymore but I just couldn't help it. It really was one of my favorites. 10. Super easy page. Added a flash card with the word "SAY" and build a quote around the word already printed on the card. 11. Added a short page to the center of this section, wrapping the blue harlequin paper over the edge. The small frame is cut from some of the Sassafras paper. 12. Pink circles are from Hambly, one of my favorite makers of overlays. I liked the idea that she could put a picture behind the overlay so faces are in the circles like little frames. 13. Almost done! Here's that paper that I was cutting up to get all the little frames (including the rose in #12). The big K is from Wendy Addison. It spins on a brad to reveal a favorite quote. A good one for a girl majoring in art. 14. Another Curly Girls card...this one I cut off the back and glued the artwork to the page. The envelope is empty...something to keep her future report cards in. Back Cover....lots of Happy Tape and Tim Holtz Tissue Tape. Today's post is aptly named because it just proves I don't need any buy anything to make a great journal. I wanted to make a journal of my friend's daughter who graduated from High School this last week and will be going away to college in the fall. First of all she's an art major so I knew she would "get it" when I presented her with something so undone. I used a ring method of binding so she could easily add things with just a standard hole punch. 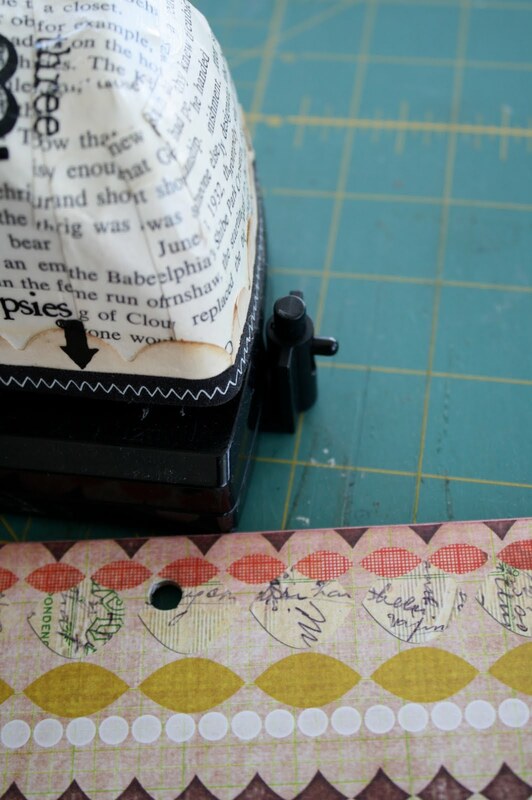 I started the journal using the 7gypsies Binderie Punch and a more advanced punching method, but finished all the add-in's using a standard hole punch and one of the punched pages as a guide. So I guess my reason for posting is just to say...I have a lot of stuff around here (I bet you do too) and you can make good things out of it. Today, I will start with the cover and binding technique. Tomorrow I will start posting the pages. Step 1- Cover the book board with paper. I used the 8 x 8" 7gypsies book board pack and 8 x 8 creme paper. I love this paper because it's thick, yet smooth and just the right color. I use a glue stick when I cover book board with paper. I prefer UHU or Thermoweb's One Touch Quick Stick. 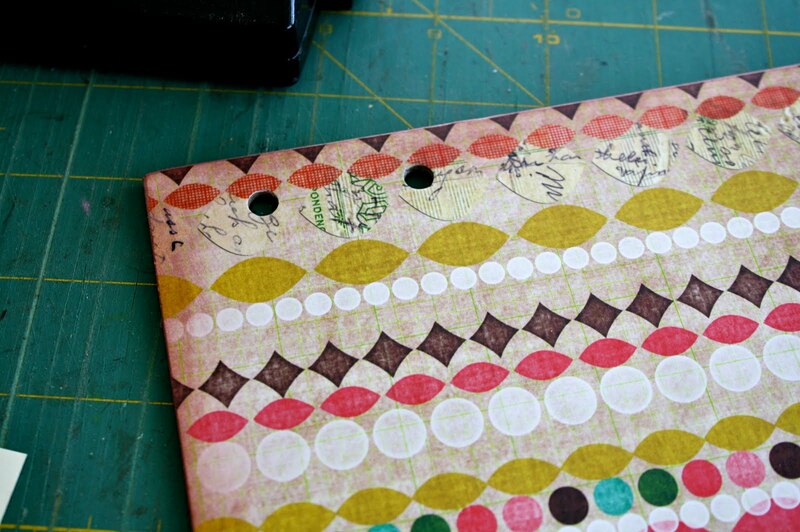 NOTE: if you are going to use the Binderie Punch to make the holes, only glue paper to one side before punching. Add paper to the back side, then punch holes with standard hole punch. The reason for this is that the thicker the book board gets (with layer's of paper) the harder it will be to slide it into the punch. My cover paper was Sasafraslass (which is a heavy weight paper) but the paper I used on the back was really thin so I did not have any trouble. Step 2 - Make a template from a piece of scrap paper. The template needs to be as wide as your journal (mine is 2 x 8"). Mark the center (since my journal is 8" wide, my center mark is 4". 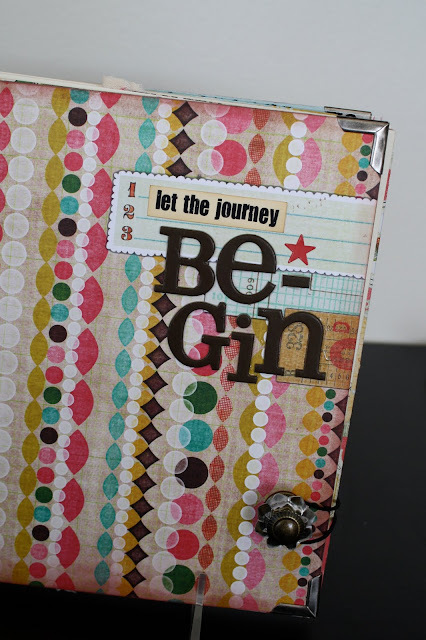 You will use this template when you punch the cover and the blank pages. Don't skip this step! You can now put the template to the side until you need it to punch the pages. Step 4 - Now here's the key to this punching method. You must push the arm to the closed position. Normally, when you use the Binderie punch the arm is one notch out to get the right spacing, but for this method you will need it in the closed position. Now hook the hole on the left side onto the button at the top of the arm. Push the button to make the second hole. If you do not have the arm in the right place this is where you will see it. The hole will be too far away from the first hole you punched. Step 5 - Keeping the arm in the same locked position, turn your cover over to punch the last hole at the top of the book. It is the same method we just did at the bottom, but the cover needs to be turned over to the back side to be able to hook it on the button for spacing. Again, make sure the arm is in locked position before punching. And here it is complete. Repeat steps for the back cover and then for the pages. Remember, with the Binderie punch you can punch 7-8 sheets of cardstock at one time. If you are still not sure you get it...cut a piece of paper/cardstock the same size as your cover and practice before you do the real thing. It really is easy. See you tomorrow for pages.